Carex muhlenbergii.John Hilty.www.illinoiswildflowers.info (Accessed 5/2014). Carex muhlenbergii is a perennial sedge, tufted, from stout rhizome, base covered with old leaves, fertile stems slender, rough, sharply 3-angled, wiry, stiff, ca 60 cm tall, much taller than leaves. Leaves thick, pale, about 0.3-0.4 cm wide, rough textured. Flowers male flowers all at tip of flower spike, female flowers below (androgynous); inflorescence 2-4 cm, thick, oblong, with 3-10 rounded, dull green, sessile spikes, crowded but distinguishable at top, somewhat separated below, bracts below each spike bristle-like, perigynia 8-20, greenish, ca 0.3 x 0.2 cm, almost round, tipped by small beak, flattened, with conspicuous veins on both sides, scales pale greenish, about as long as perigynia but narrower, June-July. 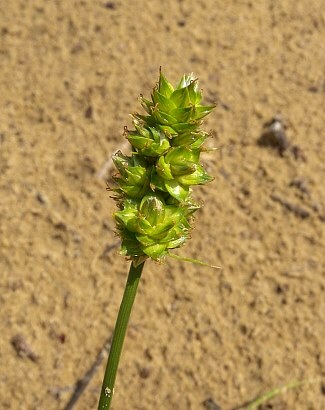 Habitat: Dry open areas, sandy soil in full sun.